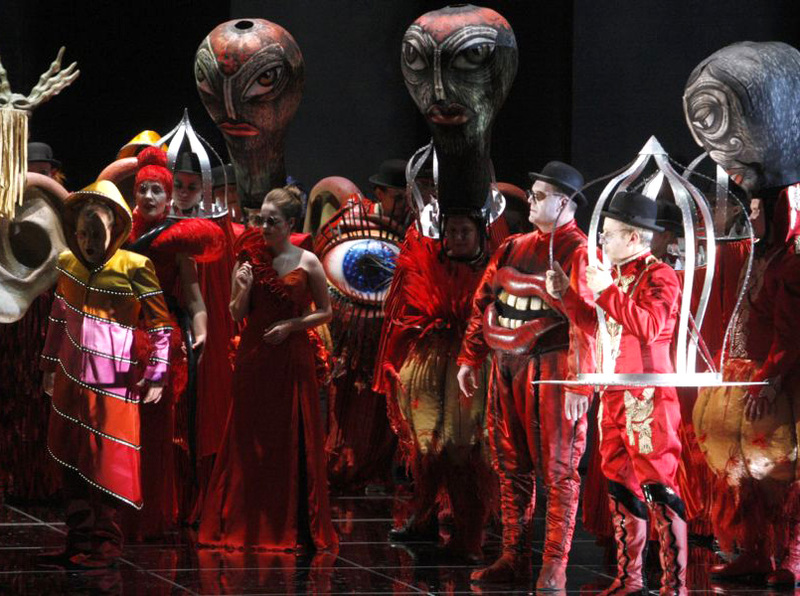 In Marij Kogoj’s opera Črne maske (Black masks, 1929), masks are used symbolically as catalysts of the soul transformation of the protagonist, Duke Lorenzo. To adequately depict different psychological states of the Duke, Kogoj used late-Romantic, expressionistic, and impressionistic elements, converging in a rich polyphonic fabric—bitonal, polytonal, and atonal. He purposely did not follow a particular compositional style, to emphasize artistic expression rather than a particular aesthetic idea. This according to “Marij Kogoj” by Matej Santi in Komponisten der Gegenwart (München: edition text+kritik, 2017). This resource is one of many included in RILM music encyclopedias, an ever-expanding full-text compilation of reference works; the entry on Kogoj is part of our January 2017 update for this encyclopedia, which also includes new entries for Sven-Ingo Koch and Vito Žuraj. Above and below, a 2012 production of Črne maske at Festival Ljubljana.